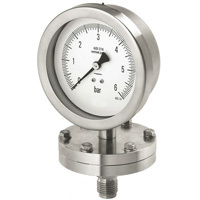 Sanitary diaphragm gauge, also called diaphragm chemical seal pressure gauge, is composed of all-stainless steel case gauge and diaphragm body. It is applicable for oil refineries, chemical plants and many other industrial areas. It particularly applies to a corrosive environment. More Information: Other material, ranges, connections are available for customers' requirements.